I had always believed that reindeer were fictional characters who pulled Santa’s sleigh, delivering gifts to all the nice girls and boys. I never really gave much thought to Rudolph being based off of a real animal, one that actually roams the snow covered mountains of Northern Norway. This was another lesson learned on my cruise of the Norwegian coast with Hurtigruten. This realization came while heading on an off-boat excursion to Nordkapp, the northernmost point in Europe located on the island of Magerøya. 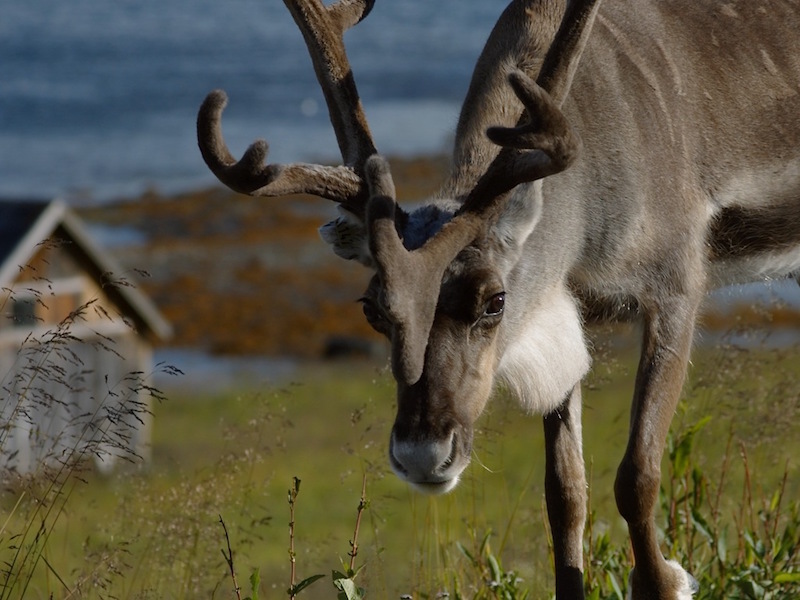 This island is home to approximately 5,000 reindeer. What? Aren’t there only eight that pull Santa’s sleigh? The animals are owned by five Sami families on the island, indigenous Finno-Ugric people inhabiting the Arctic area. 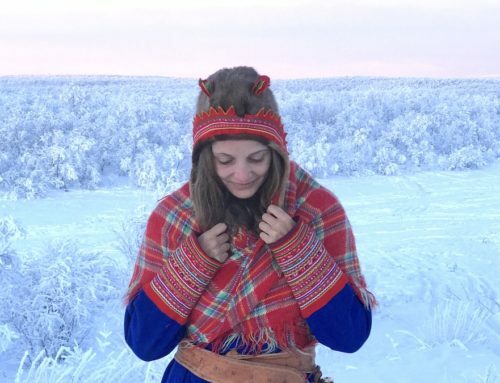 Though many of the Sami people have other careers there are also those (typically at least one family member) who choose reindeer husbandry as their course. It is a large part of the Sami culture. You don’t ask the Sami how much money they make, you ask them how many reindeer they own. This is how their wealth is determined. Though the reindeer milk is not drank, their low fat meat is widely sold on the island, either in the grocery store or from the Sami themselves. The hides are also a commodity being sold as rugs, slippers and belts. 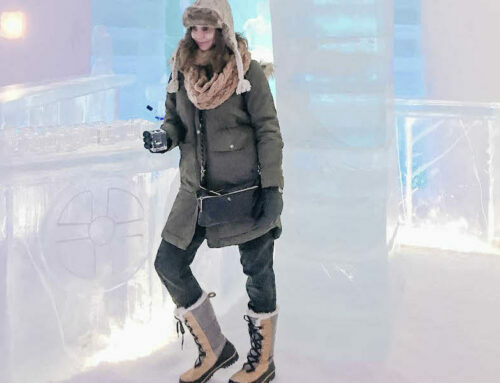 Though it is possible to buy meat directly from the Sami, we were there in the cold Winter months. During this time the families and their herd move to the mainland where feeding the reindeer is much easier. Luckily, the Hurtigruten chefs are known for using local purveyors for their meals on board the ship and there were plenty of reindeer options — a unique food experience. 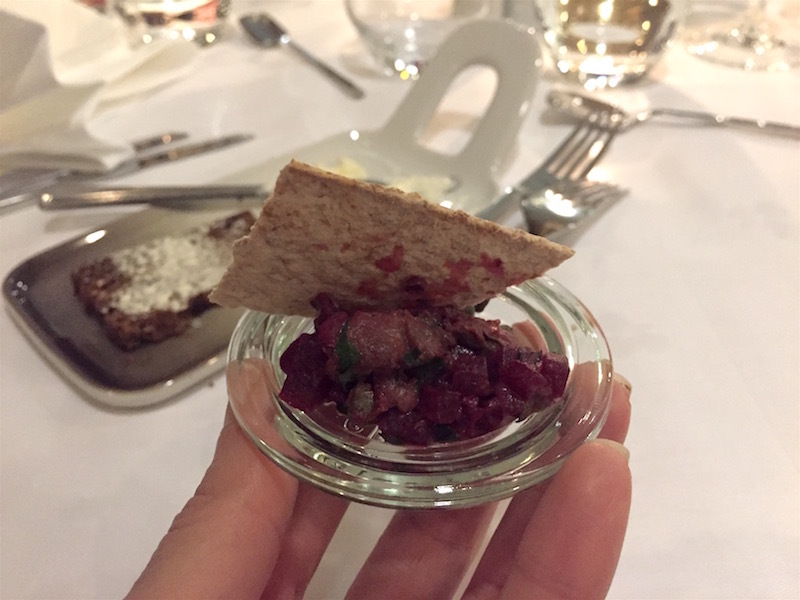 The meal started with a bite-sized sampling of reindeer tartare, an amuse–bouche. It was finely chopped and served lightly spiced.It tastes like a gamey beef, similar to deer of lamb. It is an exceptionally lean meat, which made for a delicious tartare. 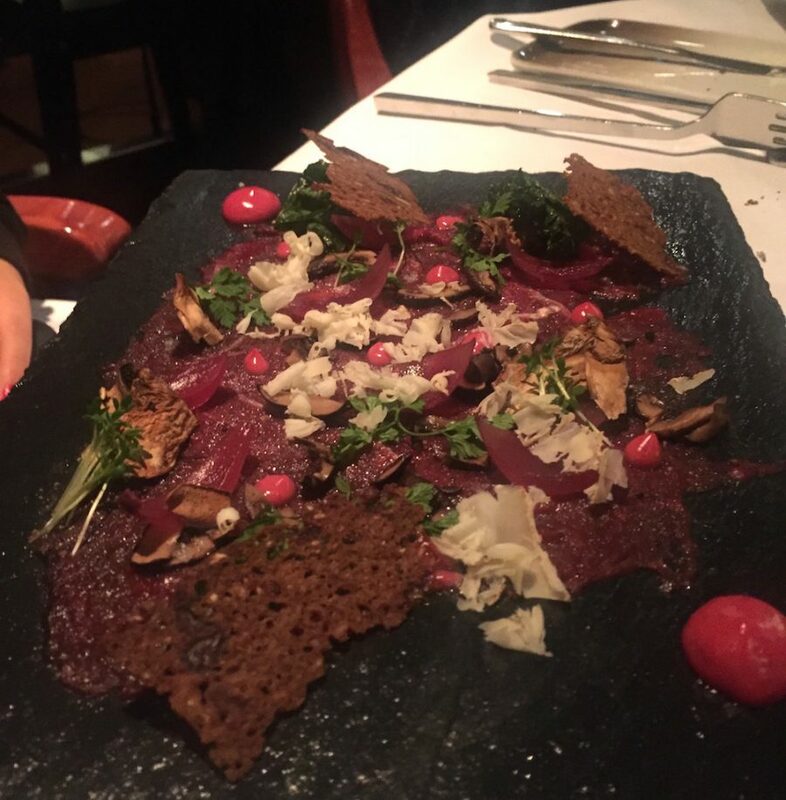 After this snack, there was reindeer carpaccio served as an appetizer. The meat was thinly sliced and topped with cheese, pickled onions and bread crisps. It practically melted in your mouth. 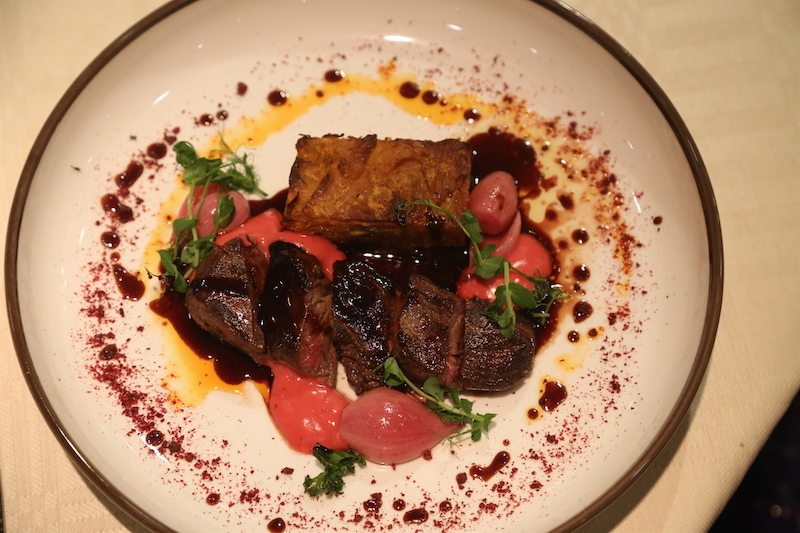 The main course was reindeer from the mountain plateau in Finnmark made with goat cheese from Aalan Farm in Lofoten,rutabaga, pickled red onion and a blackcurrant sauce. It was tender and cooked perfectly medium rare. Even though my intention was to not eat the entire thing, especially after filling up on the prior dishes. I did. It was that good. Sorry Santa, I suppose I will be on the naughty list this year. My trip to Norway was hosted by Hurtigruten, but all opinions are my own. They are in the deer species!